Christmas has become collectible and this can be seen most evidently in the amount of interest being generated by the ornaments being created by Christopher Radko. The finely detailed, glass ornaments which often have a whimsical feature actually came about due to an accident. “In 1983, Christopher decided that his family’s old, rusted tree stand had served long enough and replaced it with a gleaming stainless steel, contemporary model. The family complied and put their 14-foot tree in the new stand. As was common to their tradition, the collection of 2,000 hand-made, mouth-blown glass ornaments was carefully unwrapped and placed on the tree – a process that usually took several days. 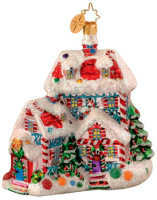 In an attempt to replace the lost collection, Christopher scoured the local shops for glass Chritstmas ornaments. It seemed that the traditional glass ornament had stopped being made, being replaced by mass produced plastic items. In a trip to Poland the following year, Christopher planned to look for traditional glass ornaments. After being unsuccessful again, he decided to see if he could find a glass blower to make some ornaments, based on his designs. Upon his return the ornaments proved a huge hit with his friends. Another trip to Europe, some new designs and success in selling to New York stores and the company was formed. The ornaments are created using traditional glass blowing methods, silvered and then hand painted. The process means that each ornament is unique and that mass production is never an option. NOTICE – This site is not affiliated with Christopher Radko or Radko TM. 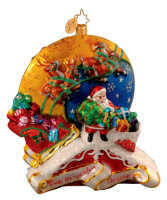 The purpose of these pages is to provide information to collectors of Radko Ornaments.